This incredible model is a classic FTF F8.8.20D, recreated perfectly in bricks for hauling… bricks. The strange-looking yellow device mounted in the rear allows heavy loads to be unloaded swiftly and the model is packed with a vast amount of other authentic detailing. TLCB Master MOCer Dennis Bosman is the builder behind it, having recently updated his model with LEGO’s latest parts. A large gallery of stunning imagery is available to view on Flickr, and you can read our interview with Dennis revealing how he builds his amazing models such as this one by clicking here. This stunning model is a near perfect replica of one of the most powerful trucks of the 1970s, the 375bhp V8-powered Scania LBS141. Built by Master MOCer Dennis Bosman aka LegoTrucks it’s very probably one of the most accurate recreations of a real-world vehicle that this site has ever featured; there are even parts of this build where offsets are less than half-a-stud in width. Much like a bumblebee shouldn’t – by all mathematic calculations – be able to fly, we’re pretty sure that an offset of less than half-a-stud is an impossibility too, but nevertheless Dennis has confounded the maths. There’s lots more to see of this incredible creation at Dennis’ photostream, which is packed full of exquisite models such as this. Click the link above to gaze in wonder, and you can read more about the builder via Season 1 of our Master MOCer series here. Dennis Bosman’s mighty Scania R500 with Broshuis extendable trailer has appeared here before, and he’s recently updated his build to reflect the unique way that long items can be transported in the Netherlands, with the load raised above the cab to reduce the overall vehicle length. It’s a seriously impressive piece of equipment, whether in real life or Lego form, and you can see more of the brick-built version on Flickr by clicking here. The ridiculously talented Dennis Bosman has featured here numerous times over the years (and is one of our original Master MOCers), and he’s recently re-visted one of his oldest builds. This incredible recreation of a Menck M154 dragline excavator was built by Dennis over 12 years ago, and it’s now been re-photographed atop his stunning Scania R500 truck complete with Faymonville low-loader trailer. The beautifully built truck and trailer measure a combined 7ft in length, which gives some indication of just how massive the dragline is. You can see more of the Menck and the incredible details and functionality it contains by clicking this link to Dennis’ photostream, where you can also see the full gallery of his Scania R500 and low loader with a variety of awesome loads. 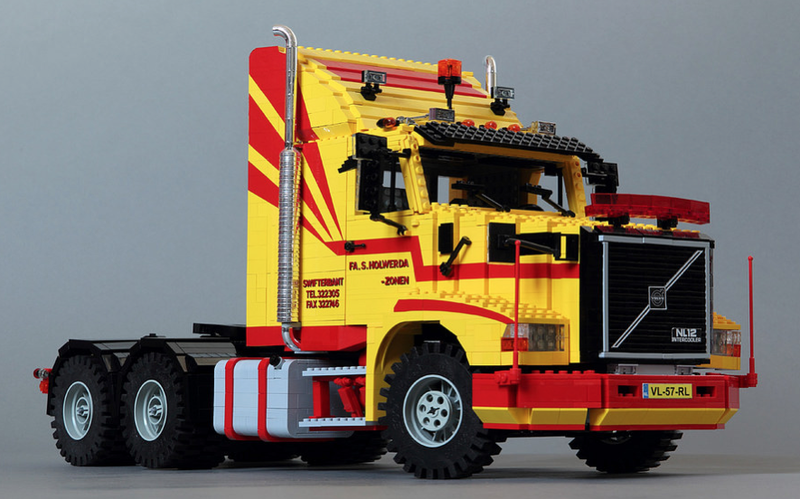 This beautiful Volvo NL12 long-nose truck comes from Master MOCer Dennis Bosman (aka Lego Trucks). As with all Dennis’ builds the Volvo’s detailing is spectacular, but it’s the paint job that excited the Elves – yellow and red meant two Smarties for the lucky finder. To us it looks like it was inspired by the country of Macedonia*, who probably have – if you’re an Elf – the best flag of any nation. You can see more of Dennis’ truck at his photostream via the link above, and you can read about his Lego story in TLCB’s Master MOCers series. *If you’re an American, click here. Every man’s dream is to have a front heavy ride, if you know what we mean. Flickr’s Dennis Bosman aka LegoTrucks has taken the same approach to his latest build by inserting two ridiculously enormous twin-supercharged V8 engines into the front of his Hot Rod. Entitled ‘Double Trouble’ the driver sure looks like he’s having a good time sitting behind that massive pair. See all the photos on Flickr via the link above, and add your double-entendres to the comments! We’re only three days into the new year and the Elves have already found possibly the best vehicular MOC we’re likely to see. This astonishing build is the work of Dennis Bosman aka LegoTrucks, and it’s taken him over two years to complete. Up front is a beautiful Scania R500 8×4/4 tractor unit, behind which is a Faymonville Megamax low loader trailer, giving a total vehicle length of an incredible 2.5 meters. The Megamax’s load is just as spectacular as the rig carrying it; an enormous vintage Menck M154 bucket excavator complete with boom extension. Each model is a work of brilliance in its own right, and put them all together and you have one of the most realistic creations we’ve ever featured. To see all the photos of the Scania, the Megamax steered-trailer and the Menck excavator make sure you visit Dennis’ Flickr photostream via the link above, where you’ll also find images of the real truck, trailer and load combination that inspired this amazing build. We’re kicking off the week here at TLCB with some big creations. First up is this colossal Scania R124G complete with low-lowder trailer and excavator. Built by Dennis Bosman aka ‘legotrucks’ you can see more of the rig here. Next is one of the more unusual vehicles that we’ve featured, but without which all the others here would have nowhere to drive. They’re a pair of grader/scrapers, used for removing old tarmac before new is laid. Suggested to us via the Feedback and Submission Suggestions page they’ve been built by bricklington on Brickshelf, and you can see the full gallery via the link above. The collaboration continues between two of the world’s most talented Lego truck builders. This incredible Scania 143 truck, previously featured here at TLCB, is the work of BricksonWheels on Flickr. His equally talented compatriot, Dennis Bosman, a prolific truck builder in his own right, adds a perfectly suited Bulthuis Potato trailer to complete the rig. We’re delighted to announce that we recently bagged an interview with BricksonWheels, who becomes the second builder in our Master MOCer Series. Click here to read his story, or visit the ‘Interviews’ tab on the homepage menu.